سنة 1700 (MDCC) كانت سنة بسيطة تبدأ يوم الجمعة استثنائية (الرابط يعرض التقويم كاملاً) التقويم الگريگوري، السنة 1700th بعد الميلاد (م)، السنة 700th في الألفية 2، السنة 100th والأخيرة في القرن 17، والسنة 1st في عقد 1700 بين 1583 و 1929 ومع فارق 1700 is 10 يوم عن التقويم اليوليوسي، والذين ظلوا مستخدمين حتى التحول الكامل إلى التقويم الگريگوري في 1929. As of March 1 (O.S. February 19), when the Julian calendar acknowledged a leap day and the Gregorian calendar did not, the Julian calendar fell one day further behind, bringing the difference to 11 days until 1799. January 26: Cascadia earthquake and tsunami. 11 يوليو – أكاديمية العلوم الپروسية تتأسس، برئاسة گوتفريد لايبنتس. August 18 (August 7 O.S.) – The Peace of Travendal is concluded between the Swedish Empire, Denmark–Norway and Holstein-Gottorp in Traventhal. On the same day, Augustus II, King of Poland, and Peter the Great, قيصر روسيا, enter the war against Sweden. آخر الصيف – جيش روسي يغزو إستونيا السويدية، ويحاصر بلدة نارڤا. 15 نوفمبر – لويس الرابع عشر accepts the Spanish crown on behalf of his grandson Philip of Anjou, who becomes Philip V of Spain (to 1746), thus triggering the حرب الخلافة الاسبانية (1701-1741). 18 نوفمبر – الحرب الأهلية اللتوانية – Battle of Olkieniki: The anti-Sapieha coalition is victorious. 23 نوفمبر – Pope Clement XI succeeds Pope Innocent XII, as the 243rd pope. 30 نوفمبر (November 19 O.S. 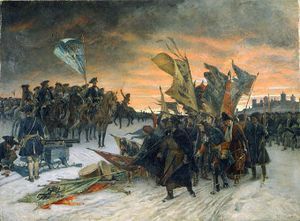 ; November 20 Swedish calendar) – معركة نارڤا, Estonia: Having led his army of 8,000 on a forced march from Denmark to إستونيا، كارل الثاني عشر من السويد يهزم الجيش الروسي الضخم. 28 ديسمبر – Laurence Hyde, 1st Earl of Rochester, is appointed Lord Lieutenant of Ireland. Mission San Xavier del Bac تتأسس في اسبانيا الجديدة بالقرب من توسن، كإرسالية كاثوليكية اسبانية. An inventory made for the Medici family of Florence is the first documentary evidence for a piano, invented by their instrument keeper بارتولوميو كريستوفوري. قيمة مبيعات المنتجات المصنعة الإنگليزية إلى الاقتصاد الأطلسي كانت 3.9 مليون استرليني. الحاج مصطفى أحد دايات الجزائر يستلم الحكم، توفي في عام 1705. ^ Colville, Ian (2011-02-08). "The Lesser Great Fire of 1700 in Edinburgh". On this day in Scotland. Retrieved 2011-11-21. 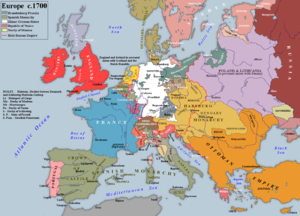 ^ "The House Laws of the German Habsburgs". Retrieved 2011-11-21. ^ O'Connor, John J.; Robertson, Edmund F. (August 2004). "Berlin Academy of Science". MacTutor History of Mathematics. Retrieved 21 November 2011.